Stubby Dog's Art Auction is in full swing! 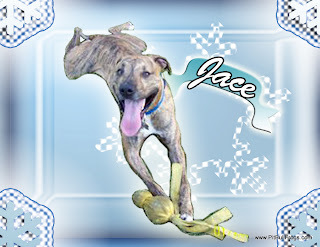 Head on over to "bid for good" on some amazing DOG ART! You know, the gift giving season is just around the corner (YIKES!) and Stubby Dog's Art Auction has lots of gift options for your dog-loving furiends. If you've been looking for an artist to paint the perfect portrait of your pooch you need to check out this auction! As you know, Stubby Dog's focus is on being a positive force for Pitties, but you don't have to be a Pittie to take advantage of the portraits or photography sessions or any of the amazing art for sale. Just sayin'. There are lots of other cool items up for bid, too! You'll find a gift certificate from Karma Collars and they'll even help you design your own custom collar! The bidding has started and continues through December 5. So you still have plenty of time to fetch a great deal and help Stubby Dog continue their awesome work for Pitties! 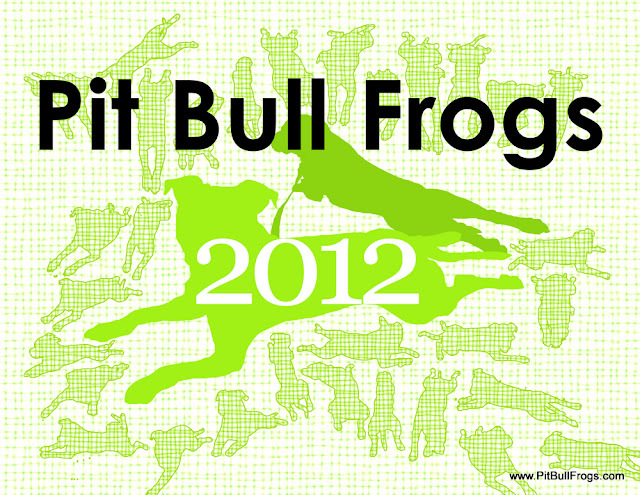 Stubby Dog is one of the organizations we will be donating proceeds of the Pit Bull Frogs calendar! Hi everyone! Happy Pit Bull Awareness Day - we also like to call it Pit Bull Appreciation Day! 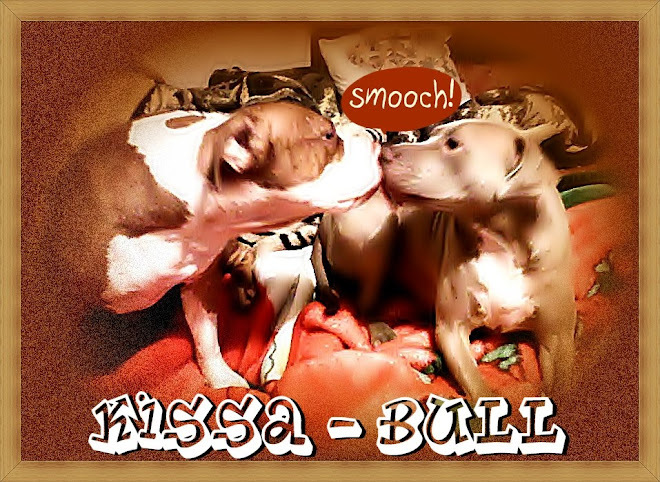 This day devoted to the celebration of Pitties was started by Bless the Bullys in 2007. Sandy and her foster mom over at the Peaceful Dog, will be celebrating at an adoption event for Jasmine's House (Sandy's rescue sponsor). By the way, Sandy and Fozzie (Sandy's foster brother) will both be making appearances in our upcoming soon-to-be-released Pittie calendar (see info below). So, if you're in the Arlington, VA area, stop by Dogma Bakery who is hosting the event. 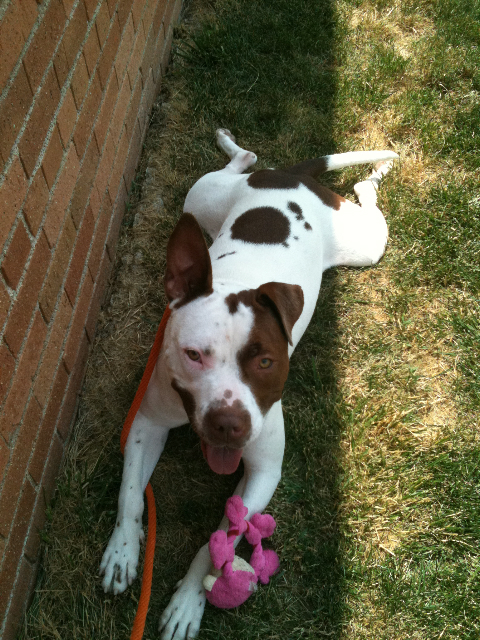 Say "hi" to Sandy, who is looking for her forever home BTW, and pick up some yummy treats! 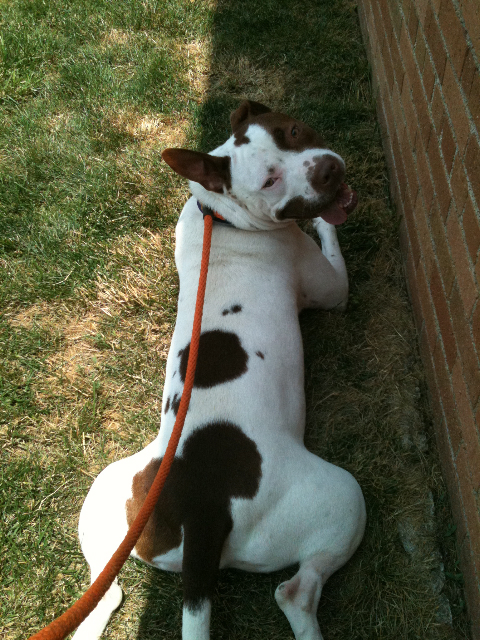 Love and a Six Foot Leash is sponsoring a special Adoption Event at the Montgomery County Humane Society! Check out their blog for all the details, especially if you're in the DC area! 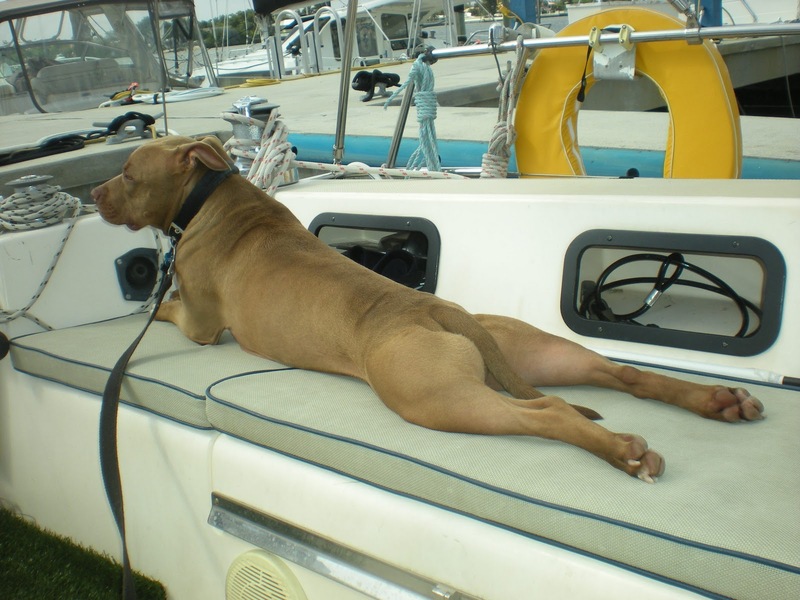 Dogster is hosting a fabulous event on their blog that you can join without having to leave home - Share Your Pit Bull Story! 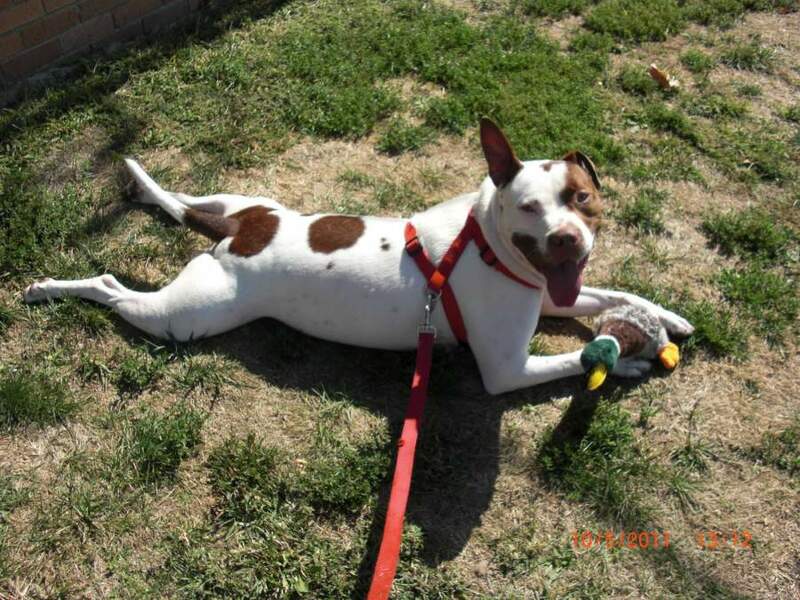 What better way to celebrate Pit Bull Awareness Day than to share your awesome positive Pittie stories for everyone to read. Great idea Dogster! There are lots more PAWSOME PITTIE events going on, too. Check out this page at Bless the Bullys to see if there's an event in your city. We want to celebrate the awesomeness of Pitties, too! We will be publishing our Pit Bull Frogs calendar in the next few weeks. 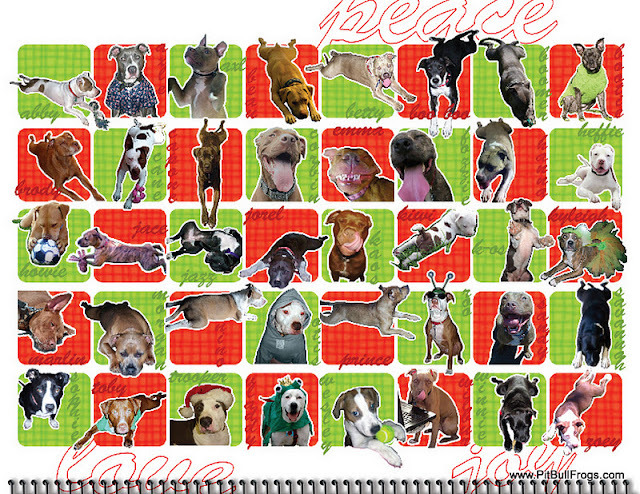 The proceeds from the sale of the calendar will be going to organizations that help Pitties in so many different ways. We were inspired to create this calendar when we met Wilbur (of Knotty Cat Tales) through Two Pitties in the City's blog (featuring the incomparable Mr. B & Miss M) when they featured him in their "How to Be a Tourist With Your Dog Series" this summer. 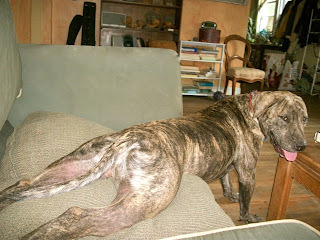 We fell in love with Wilbur's awesome frog pose and the calendar idea was born. 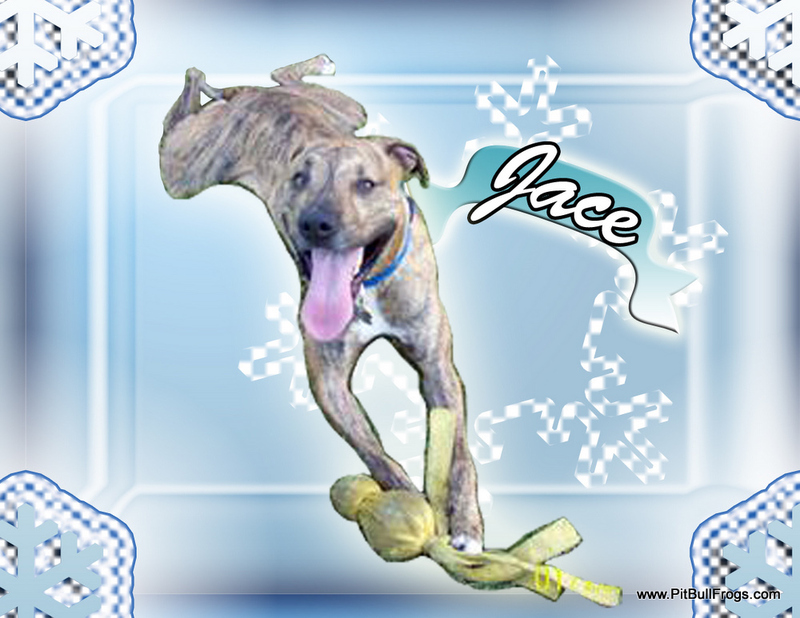 We wanted to show the adorabullness of this often misunderstood and misrepresented breed. We think the frog pose captures their adorabullness perfectly! Our call for entries was answered by over 40 Froggy Pitties and we fell in love with each and every one - so much so that we just couldn't choose! And thanks to the awesome artistic talents of Danielle Greisen, we didn't have to! You will get to see them ALL! 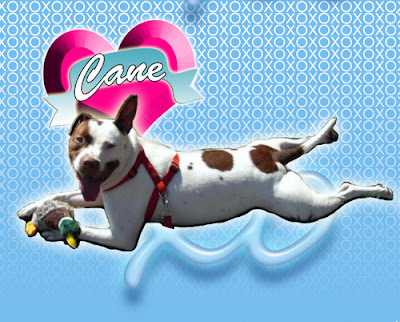 Our calendar showcases Pittie adorabullness like you've never seen before. 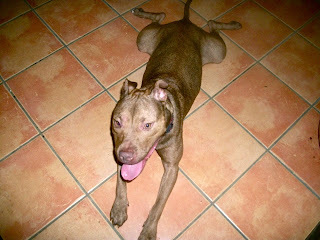 Click on our Photos Page to see all the Pit Bull Frog entries. 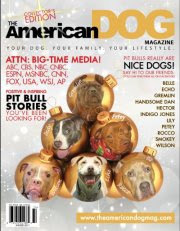 You will be also able to read about each of the Pitties featured in the calendar right here on our blog throughout the year. Wait until you read their stories. You will laugh, you'll cry, you'll smile, you'll go Awwwww a lot! Stay tuned for details on how to purchase your very own Pitties in Frog Pose calendar and help support organizations that support Pitties!